The Sunday festival was established by Srila Prabhupada to offer people, who otherwise cannot assist the temple during the week because of work or other reasons, the opportunity to participate in the temple programs. And every ISKCON temple around the world goes to extra lengths in preparations for offering the best of their facilities to their guests. The Sunday feast in the Mexico temple was a special event, a unique phenomenon in the whole movement, because of the great acceptance it had among the local people who assisted every week by the hundreds, filling the temple up to its full capacity. Apsara devi dasi: I remember that from the previous temple people would assist the Sunday feast in great numbers, and they always seemed to be increasing more and more; every Sunday people surprised us because of their assistance. Because of Srila Prabhupada's presence this Sunday was special. Early on during the day regular guests and other curious people started to arrive at the temple. They wanted to meet Srila Prabhupada because some of them had seen him on television. So during the day people were arriving and gradually filling the temple. As usual some devotees would talk to the guests who arrived early. It was a regular program to have a kirtan lead by Rohini Kumara das before the lecture started. At that time the temple was full and people kept arriving. The vyasasana was placed in the temple's main entrance hall by the staircase that went up to the first floor. This hall was a sort of an inside patio having the main dome of the building as its ceiling over two stories high. All the main rooms on the first floor were lined up one next to the other surrounding the hall and having their entrance doors open directly into it. These rooms were all connected by a balcony corridor overlooking the hall which then sloped down into a half circle staircase. As the time for the lecture grew nearer the temple started to fill up, and when the lecture was just about to start, it was full to its maximum capacity. The door to Sila Prabhupada's room was situated in front of the main hall; suddenly it opened revealing Srila Prabhupada's aristocratic figure. The devotees and assembled public then started to chant, "Jaya Srila Prabhupada, Jaya Srila Prabhupada." As Srila Prabhupada walked down the open staircase the kirtan intensified and the crowd made way for him to pass. He went towards the vyasasana, placed his cane to one side and sat down. This was the climax point in the kirtan, with all the devotees and guests jumping up and down with their hands in the air. Shymasundara das: I remember that there was a surprisingly large number of people, the temple was overflowing and Srila Prabhupada was very pleased. When the kirtan stopped Srila Prabhupada offered respects to the disciplic succession, took his kartals and began to sing: Jaya Radha Madhava kunja bihari, Gopijana valabha girivanadari. He sang for some time and when he stopped again offered respects to the disciplic succession and began his lecture. Radha Krishna das: I knew the devotees since 1971 and in 1972 I was invited by a friend to meet the guru of the Hare Krishnas who was visiting Mexico. We set out for the Sunday program that evening. When we arrived Srila Prabhupada was already giving the lecture. He was lecturing from the sixth chapter of Bhagavad Gita most probably text eleven and twelve. I know this because I daily read one chapter of the Gita at home. Srila Prabhupada talked about the sixth chapter of Bhagavad Gita where Lord Krishna mentions the different types of yogic meditation. One of the main themes in his lecture was the fact that yogis and transcendentalists, who do not follow Krishna consciousness, must impose upon themselves rigorous penance in order to control their mind and senses. Radha Krishna das: He argued about how easy it was to become Krishna conscious and how difficult these other yoga practices were in this age. These types of yoga were the kind that I practiced in those days. In other words he was defying my convictions. When the lecture ended Srila Prabhupada asked for questions. The guests asked good questions about yoga and Srila Prabhupada answered expertly, in a way that impressed the guests; so in this way the lecture came to an end. After this the devotees served prasadam, which was already very popular because of its exquisite taste. The prasadam has become of the most important features of the Sunday feast, attracting many people. Another kirtan after prasadam was part of the Sunday feast. And this one in particular intensified to the point where practically everyone present began to dance and sing. Hundreds of guests joined in and with great enthusiasm began to chant, "Jaya Srila Prabhupada, Jaya Srila Prabhupada." This caught Srila Prabhupada's attention who was already in his room. 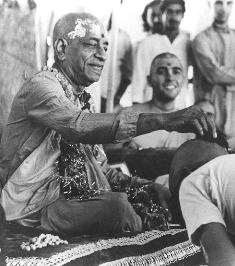 He sent the temple president to see what was going on; he went to see and then returned telling Srila Prabhupada that they were chanting his name and wanted to see him. His Divine Grace then agreed to their request. Rama Govinda das: I was talking to a girlfriend of mine who had introduced me to Indian philosophy; she went to the Sunday feast that day to listen to Srila Prabhupada. After having dinner we were conversing when a devotee announced that whoever wanted to go up to Srila Prabhupada's room could do so and have the opportunity to speak to him personally and offer him respects. We went up the stairs toward his room but we had to wait for a while because there was a line of people waiting for their turn to see Srila Prabhupada. When we were finally able to go in I could see that Srila Prabhupada was very moved and pleased by the people's attitude who were able to perceive in a natural way the spiritual qualities of a saint like Srila Prabhupada. My girlfriend was very impressed with Srila Prabhupada and left very happy because she had the opportunity to listen and to personally interview His Divine Grace. Out of some unearthly attraction a long line of inquisitive guests formed up, eagerly awaiting Srila Prabhupada's personal audience. The scriptures extol even the shortest chance encounter with a pure devotee of the Lord like Srila Prabhupada as the greatest causeless blessing (sadhu sanga sarva siddhi hoy). Snaking through the ground floor up the open staircase and onto the first floor, then leading down the long balcony corridor into Srila Prabhupada's room, the line seemed to circle the whole area as a sacred thread hanging from a brahmana's shoulder drapes over his chest. The guests would enter Srila Prabhupada's room through the main door overlooking the hall and then leave through a side door. After everyone had received some of Srila Prabhupada's transcendental bounty there was a kirtan and shortly afterwards the temple closed its doors for the day.